With everything else there is to do, don’t forget Peek A Newz! The New Uncommon Peek-A-Newz prizes this month are the Blue Floral Shower & Sapphire Spaniel Window. 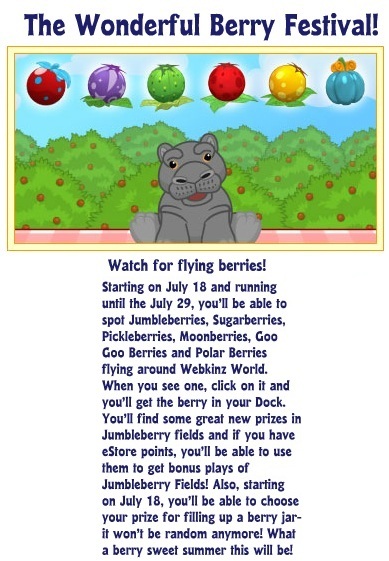 Webkinz is giving us more information about the Jumbleberry Fields updates. You can buy your extra chances in the eStore – blah. 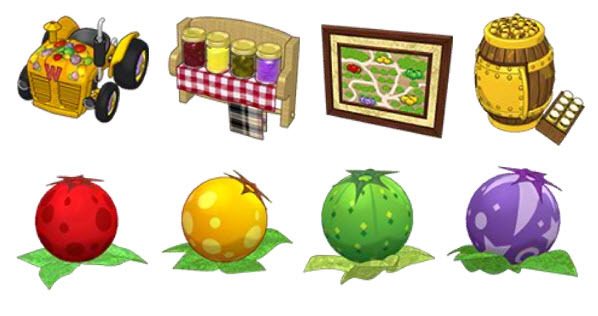 Hopefully we’ll be able to get a bunch of those berries in the Berry Festival July 18-29! 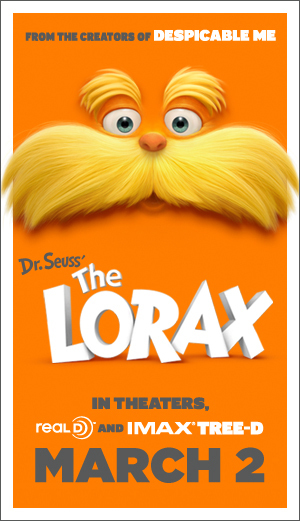 Just in time for the release of one of the most anticipated movies of the year, Webkinz World welcomes the beloved forest guardian of the classic tale, Dr. Seuss’ The Lorax. And he’s going to need YOUR help to bring all of his friends to Adventure Park! 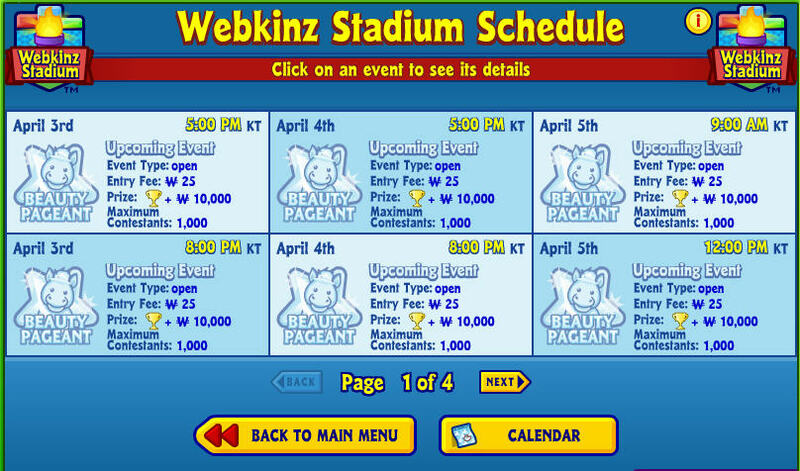 That’s why, from February 16 until March 4, the Adventure Park is open to ALL Webkinz members, except for those who block third party ads and sponsored content. Be sure to visit this champion of the trees in the Adventure Park where you can win exclusive prizes by completing his quests. 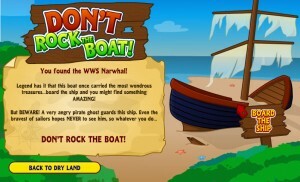 And get ready to meet the Bar-ba-loots and Humming-fish if you master the fun challenges that await you there! 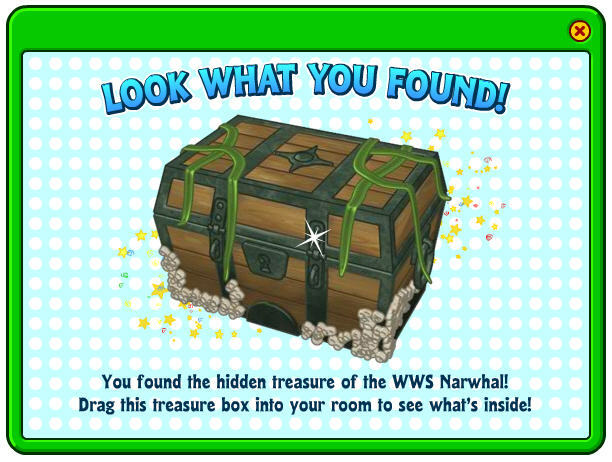 But don’t wait too long, these quests last only until March 4. 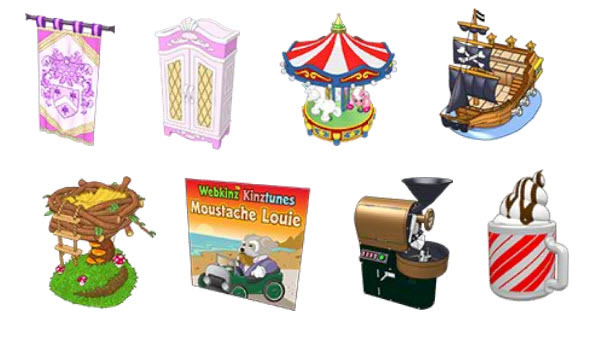 Plus, in the Arcade from February 15 to March 4, you’ll really be asking “Where’s Wacky?” when the Lorax takes over the game! 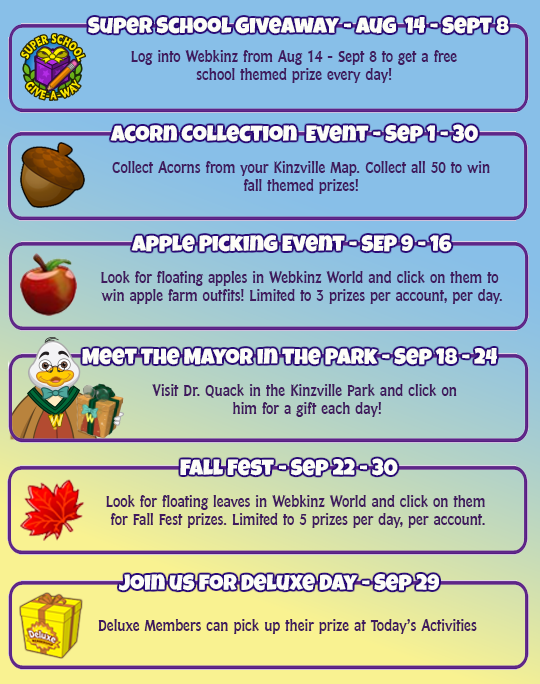 Watch for the Lorax floating through Webkinz World between February 18 and March 3 when you can click on him to win exclusive prizes. 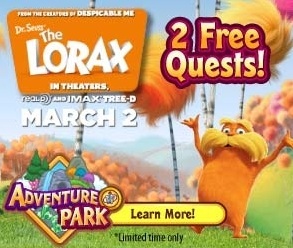 And finally, to thank you for your participation, the Lorax has something very special for you. 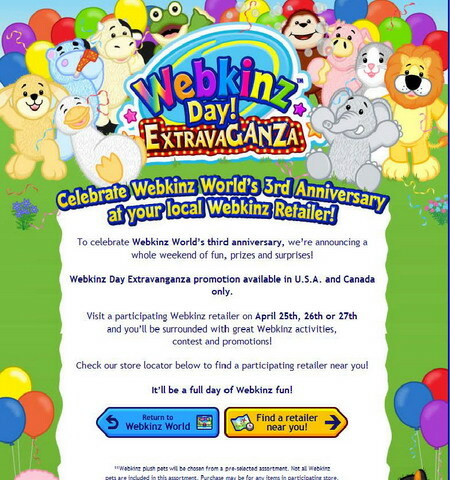 Simply log in to Webkinz World on February 29, March 1 and March 2 to receive an exclusive giftbox each day! On March 2, 2012, the creators of Despicable Me brings one the most beloved books of all time to the big screen. 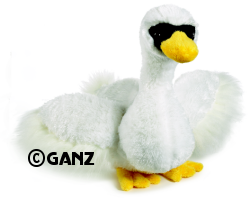 Webkinz is proud to welcome this timeless character as he fights to protect his world. 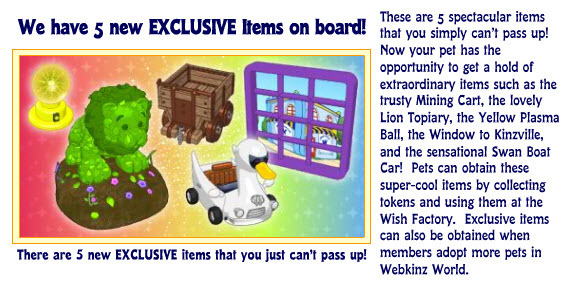 New Exclusives: trusty Mining Cart, the lovely Lion Topiary, Yellow Plasma Ball, Window to Kinzville and the Swan Boat Car. When they add new Exclusives, they always retire some. 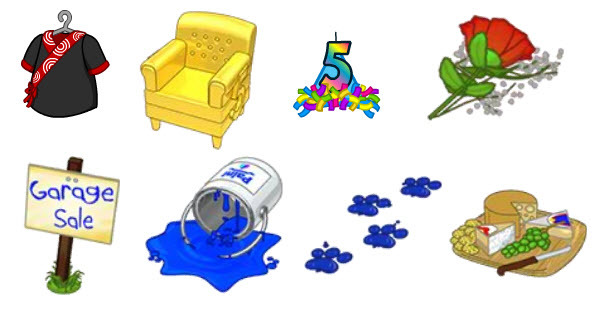 They added 5 new ones, so I don’t know why they would retire 6 old ones, but that’s what it appears that they did. The first item (Sushi Chef) is the Deluxe Gift for May! The rest are all non-sendable items which usually means they will be found in the EStore! The Blue Paw Prints is like a rug and can be placed on the floor. They also added the rest of the Stone Age theme in the W-shop! You can check those out there! Sign Side Table, Burning Light Lamp, Cosmos Coffee Table, Cool Cosmos Fridge! 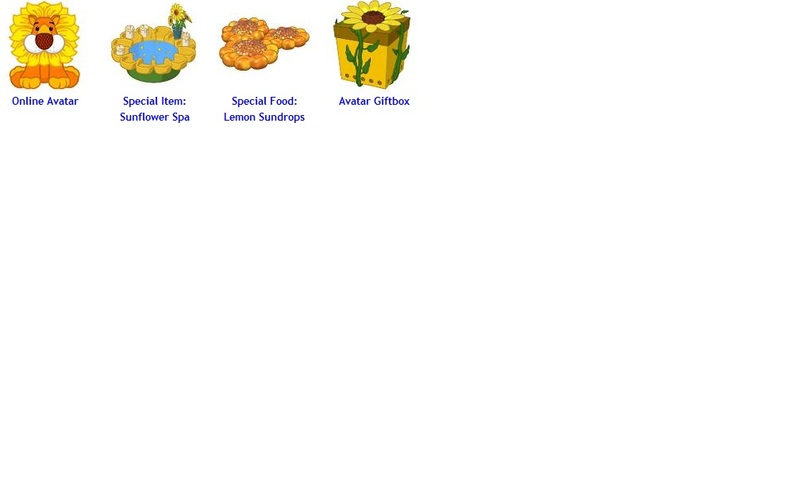 The Two Pets added this time are the Gemini Butterfly and the Sunflower Lion! 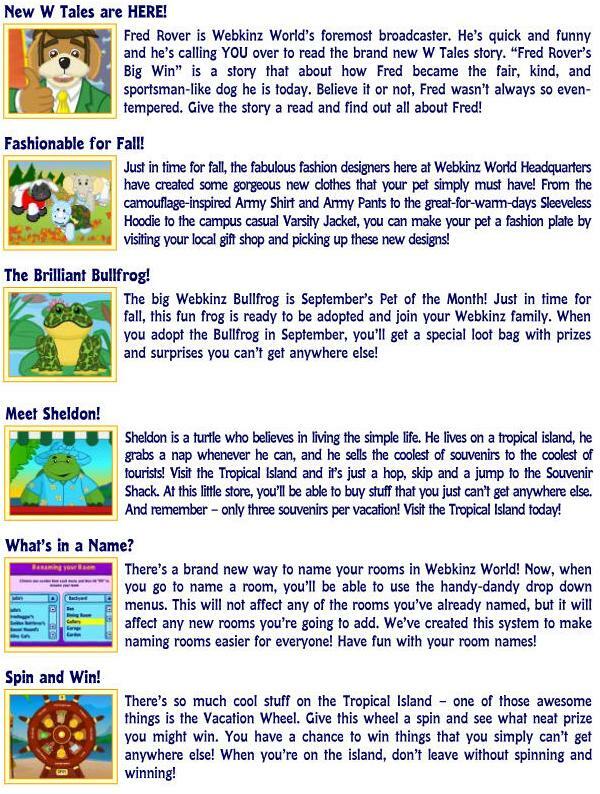 You can view those on the Webkinz Newz! Gemini Butterfly, PSI Twin Side Tables, PSF Nocturnal Nectar. 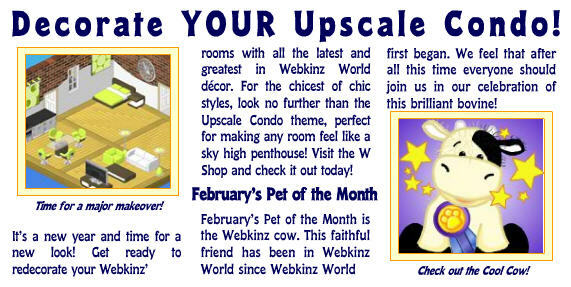 From WEbkinz Twitter: THE SCREWY LAMP WAS RETIRED. 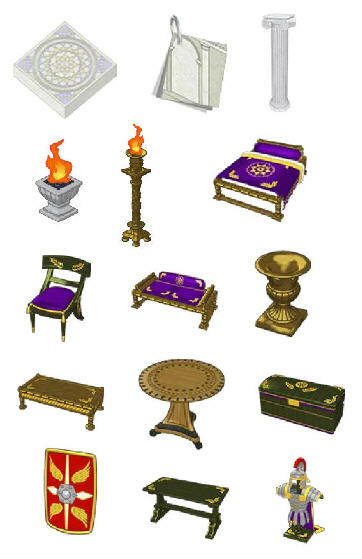 tHE CHAIR AND PEDESTAL WERE NOT. THE HIGH TECH BATHROOM ITEMS ARE NOT PART OF THE THEME. You have the “Over the Rainbow” bed, the Pink Popcorn maker, a Bowl of Popcorn, and the Leprechaun Cloverfield. 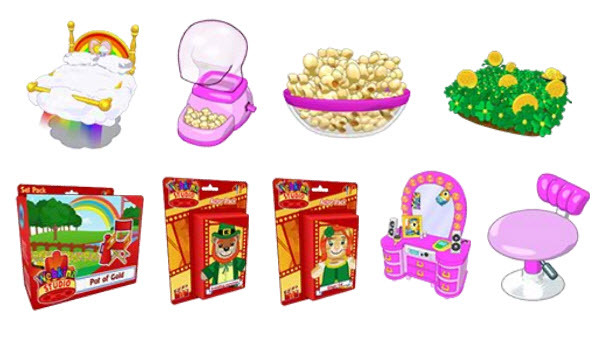 You have the Pot of Gold background, Groundhog Leprechaun Actor, Ginger Cat Actor, and the Pink Party Vanity and Vanity Stool! The Popcorn maker looks to be e-store as well as the Cloverfield and Pink Vanity items! 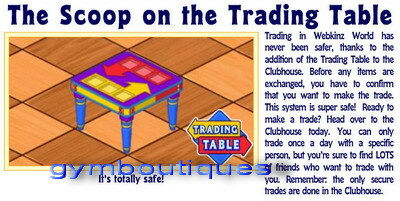 The Cloverfield is a furniture type of item and takes up 9 squares in a room. 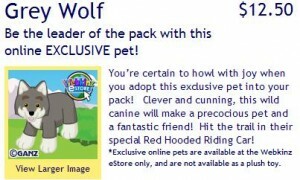 Your pet can play in it! Everything but the bowl of popcorn and exclusive bed are NON-sendable! Okay, lets get started with all of this stuff! 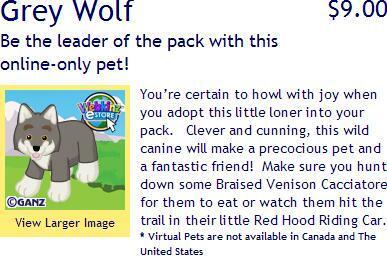 New Pets are coming..Here’s the Clover Puppy! 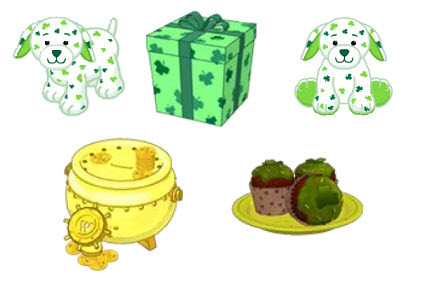 It’s item is Pot-O-Gold Safe, food is Lucky Pupcakes. 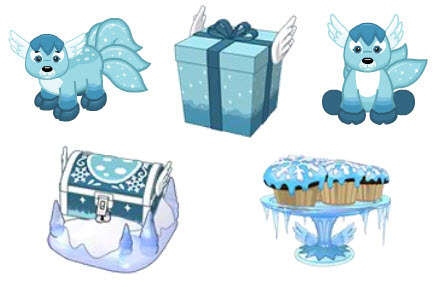 Item is Musical Ice Box, food is Frosted Ice Cakes. Item is Starlight Mint Sofa, food is Crusty Cavity Crumble. 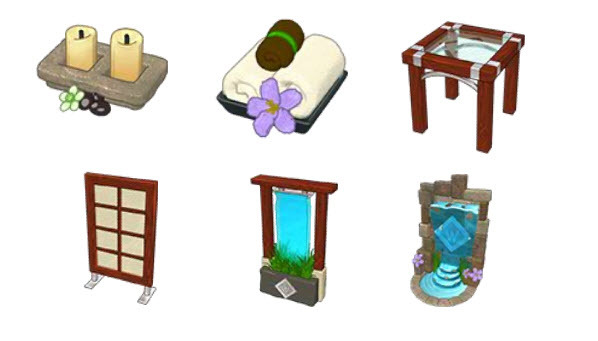 There is some kind of new Spa theme coming. It looks like it’s e-store because none of it’s sendable! 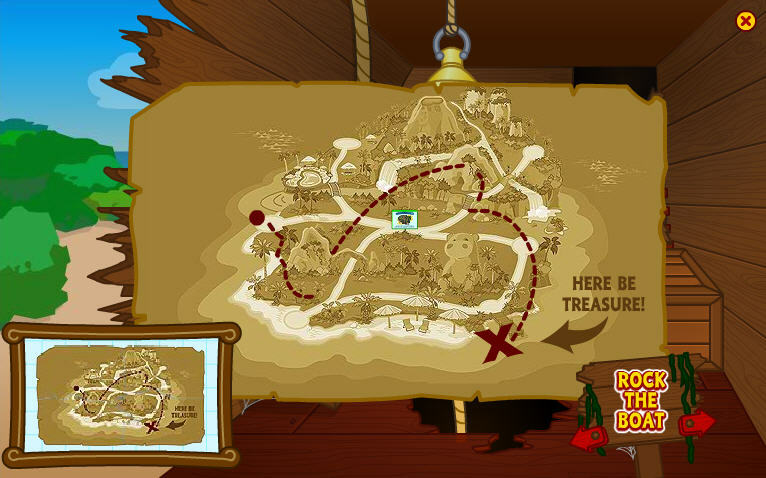 The Pirate Ship, Bird’s Nest Bed, and Hot Chocolate Machine are NOT sendable..the rest are! The Hot Chocolate Machine will give you the Cafe Style Hot Chocolate when you use it! 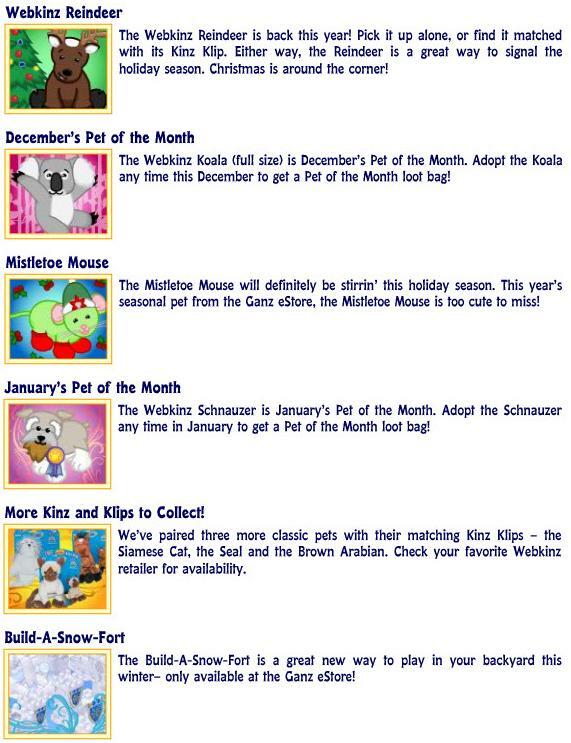 By the way, the Schnauzer is January’s Pet of the Month! 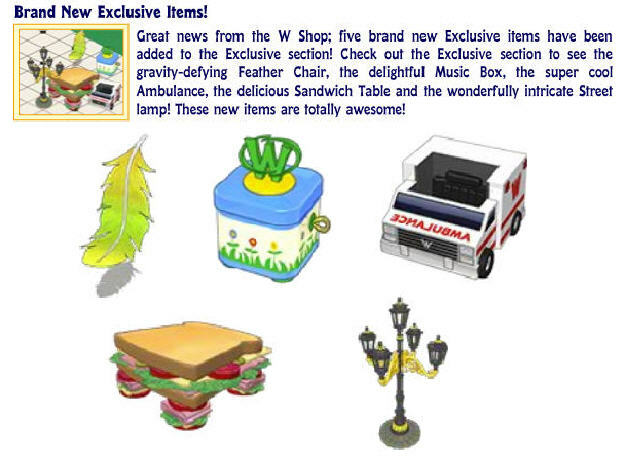 Here is the SUPER DELUXE ITEM for 2010! 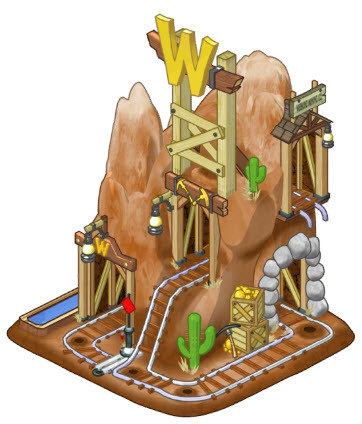 The Mountain Mine Cart Ride! 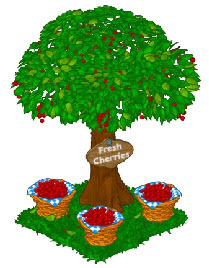 Next is the new daily game…Jumble Berry Fields! 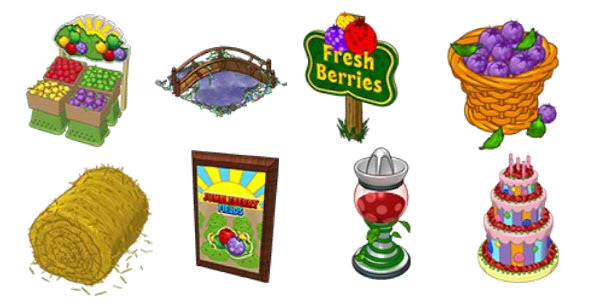 The Fresh Berry Stand Fridge (5th row, 3rd item) is not sendable and may be e-store. 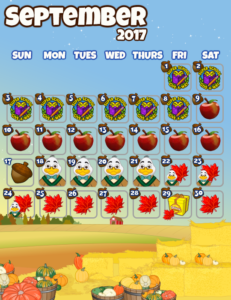 Also the berries themselves (10th row) are not sendable, but everything else is! 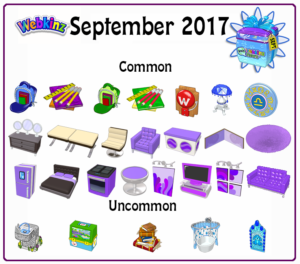 And I believe the shelf, shown in the 9th row is a W-shop item and not a prize! 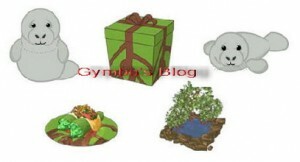 Three new pets in December: Daisy Tortoise, majestic Moose, and the baby Penguin. the victorian gown is the new deluxe membership item. 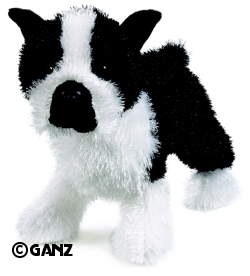 The January pet of the month is the Schnauzer. 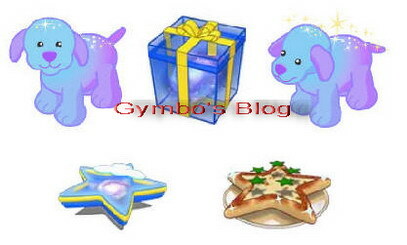 Zircon puppy is the birthstone pet for December. Koala bear is the POTM for December. 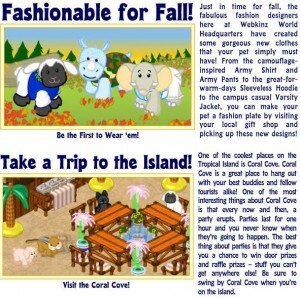 Here are the upcoming articles in the newspaper section of Webkinz World. Check out the new costumes: scarecrow and black ninja. 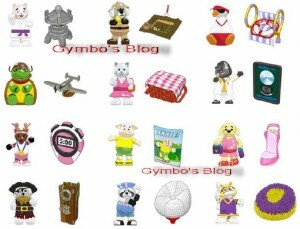 The new prizes, shown, are the Balloon Dart Hat, the Wheel of the Month Place Setting, and the Monkey Monkey book ends! There are a couple of other ones, not shown! 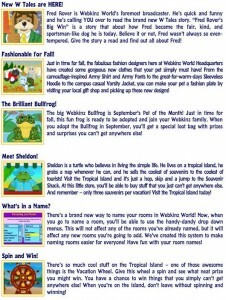 Here are the April Webkinz Pets: White Swan, Ring Tail Lemur, Boston Terrier, Polka Back Fish. 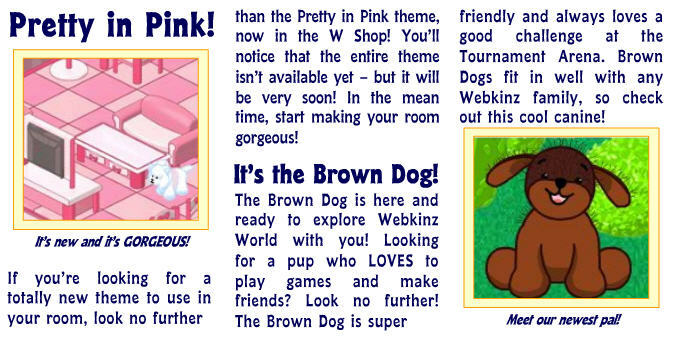 Upcoming articles: Spring Webkinz Pets are here. 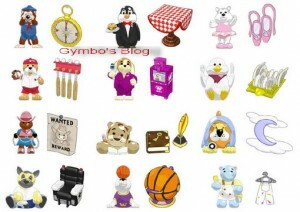 the Duck (is back), and introducing the long waited cotton candy bunny, regular size lamb and the cute lil kinz lamb. 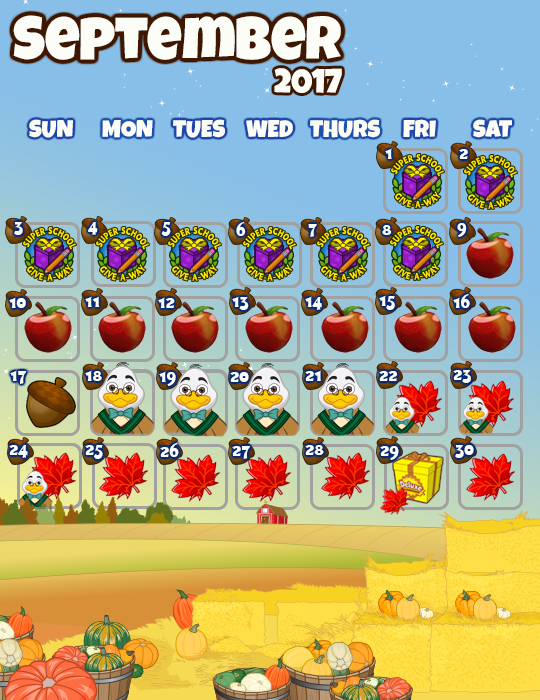 The bingoz game is still confusing for most. Before you were able to use as many coupons as you could, now you are limited to only five. 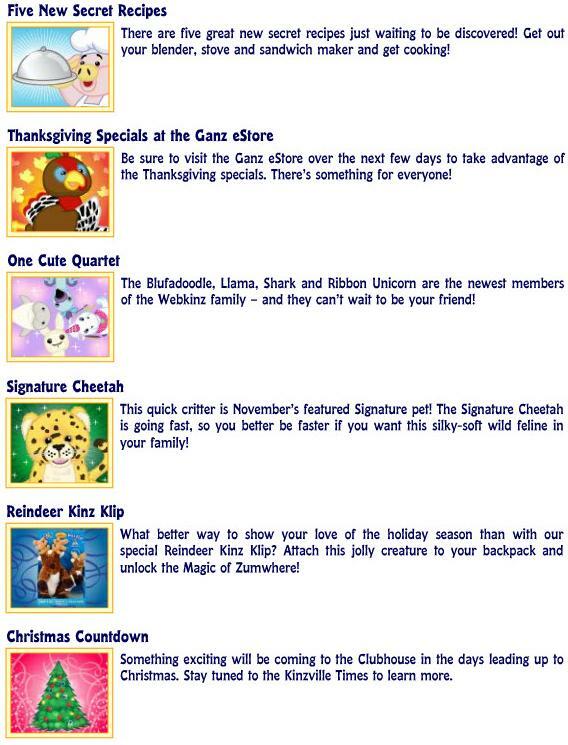 with more than 50 coupons before kinz friends had a hard time winning, much less now with only five coupons. 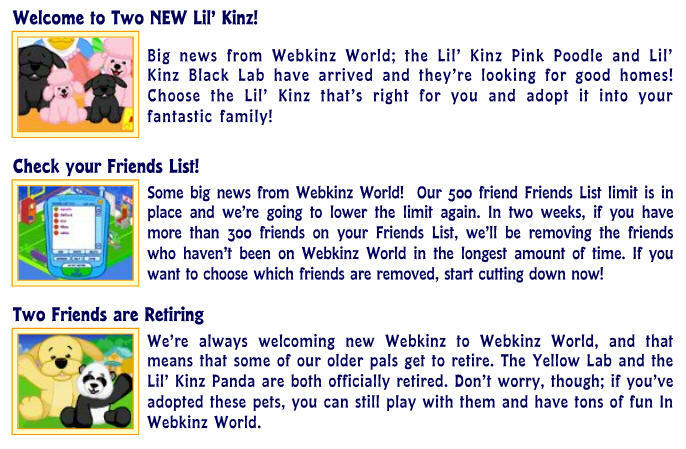 Welcome the Pink spotty dinosaur, the rocking lil kinz robin and the daring domino cat to the webkinz world. coming in March. 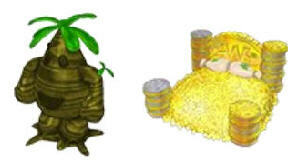 New game added to the arcade and tournament arena: Bamboo Break! 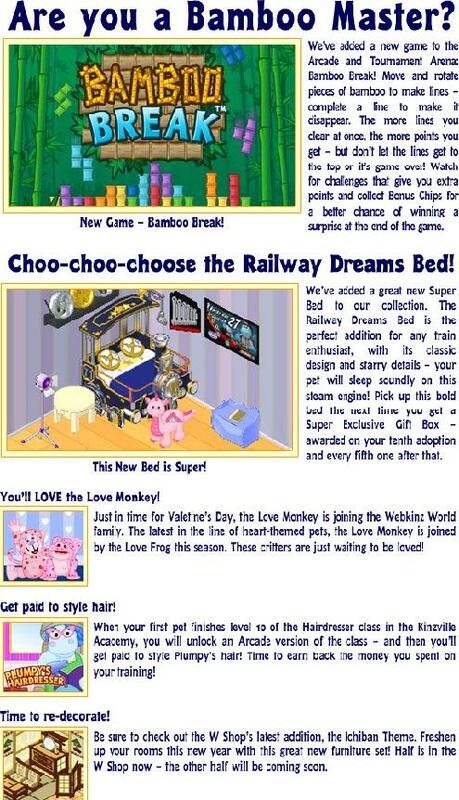 Choo-Choo – Choose the Railway Dreams Bed …..this bed has been added to the Super Bed collection. 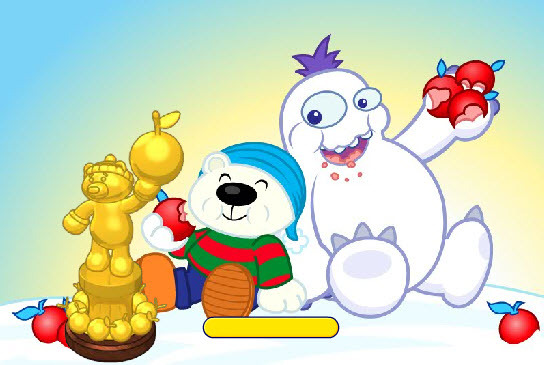 This is the trophy you get with the Bamboo Game. Harvest Time Poster Fall festival place setting, pumpkin soup, decorative cornucopia, elm tree, autumn sunset toque, orange cable knit sweater, apple cider, decorative wheat sheaf. Now back to Kayla’s contest !!! I will say Thanks Kayla ! These are the upcoming newspaper articles. Back to school Clothes, just in time for back to schoo, some great new clothing items in the WShop for your pet to wear! 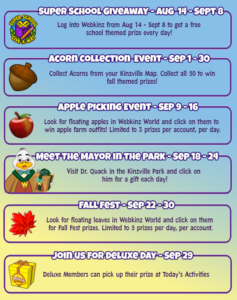 there’s the fantastic kinzville Academy shirt, a perfectly pink newsboy cap, a cool suit, a fabulous thick knit sweater and the warm and cozy stripy toque, just to mention a few. 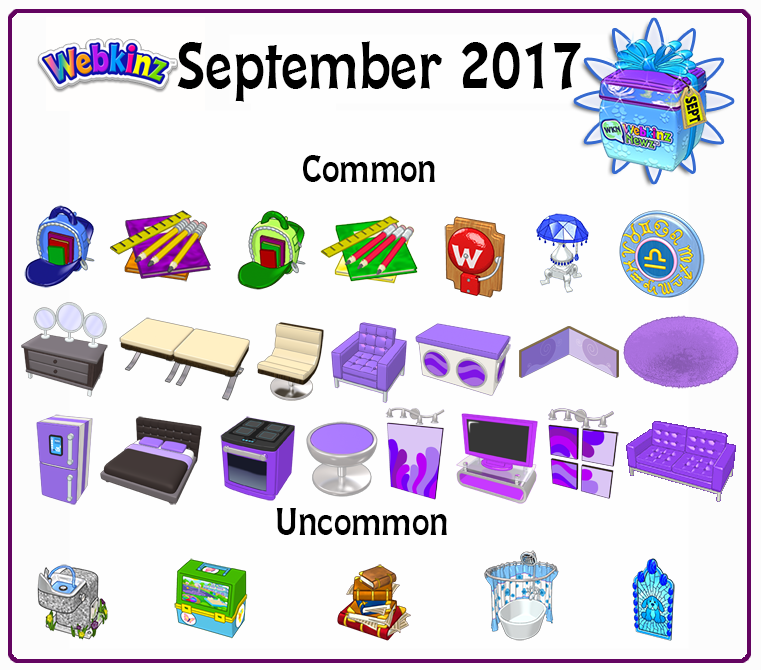 A new Rare Theme! 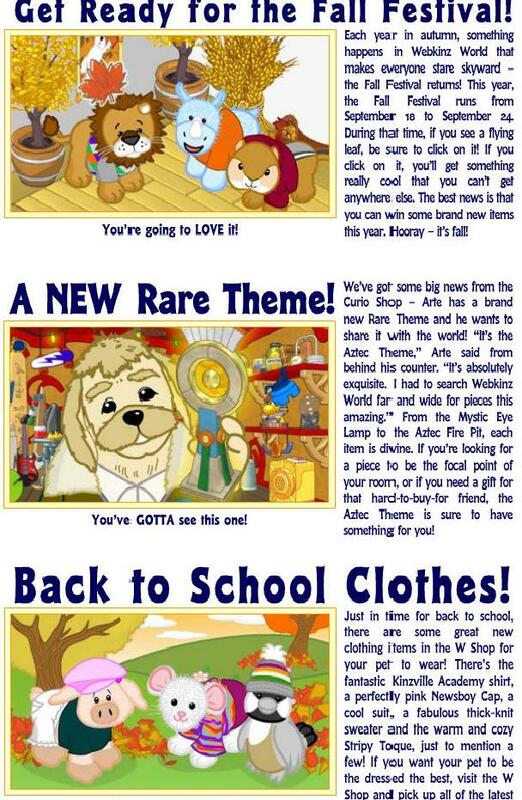 Arte has a brand new rare theme and he wants to share it with the world! 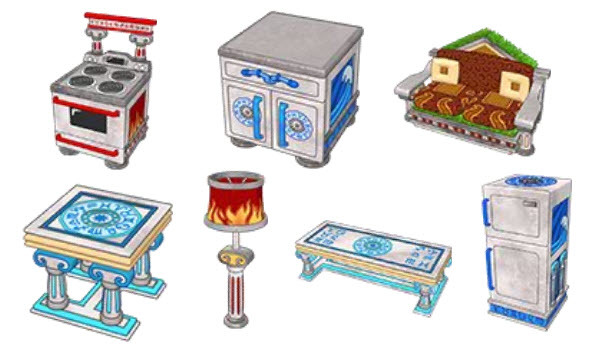 “it’s the Aztec Theme” From the Mystic eye lamp to the Aztec Fire Pit, each item is divine. Three New My Page themes (backgrounds) to use to sutomize your “my page”. From the perfectly popular Pop Star to the cheerleader-inspired Pom Pom to the cool Bamboo background. 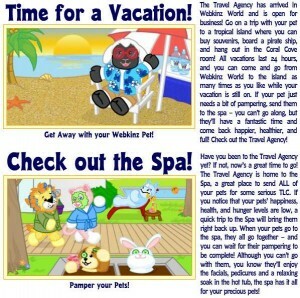 Check out the Travel Agency in Webkinz World. 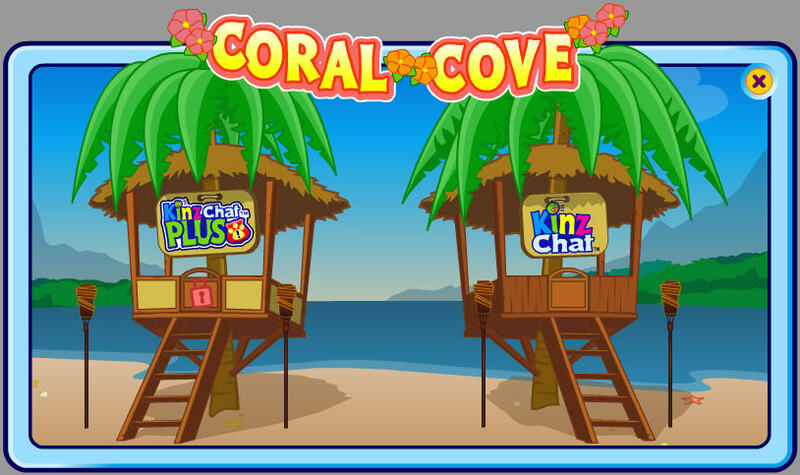 In the Tropical Island you will find: don’t Rock the Boat, Vacation Post Office, Coral Cove, Vacation Wheel and the Souvenir Shack. 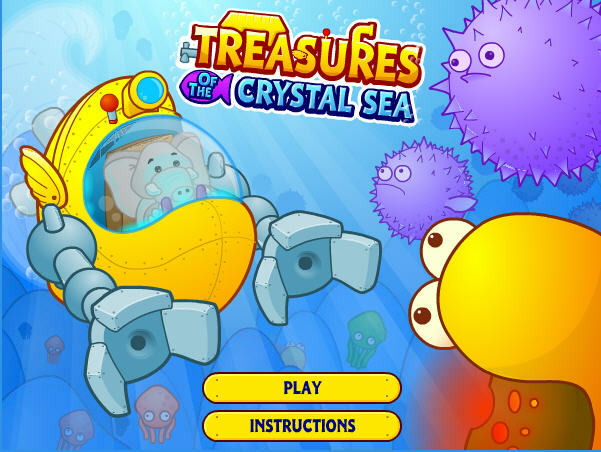 A treasure to be found…. 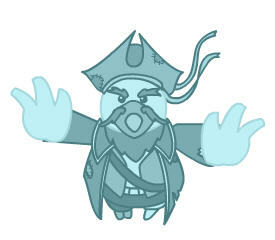 Watch out for the Ghost (looks like a parrot), it will drop your health level to zero. Another game will be Treasures of the Crystal Sea! It’s some kind of exploration game. I don’t have much on it at the moment. 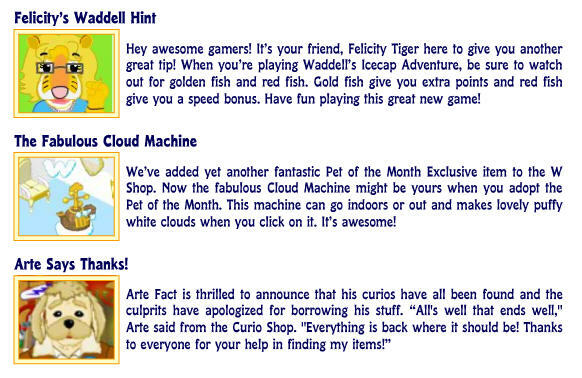 I did read that you can win a “Rainbow” Goldfish! 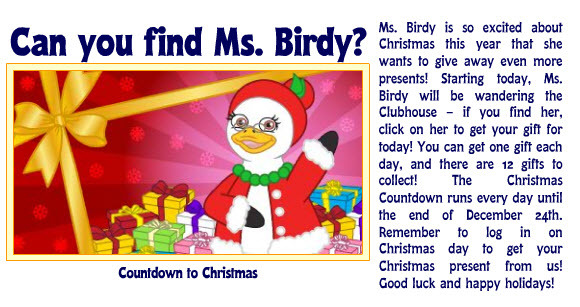 I don’t know if that’s a virtual pet or some other kind of prize, so we’ll have to wait to find out! 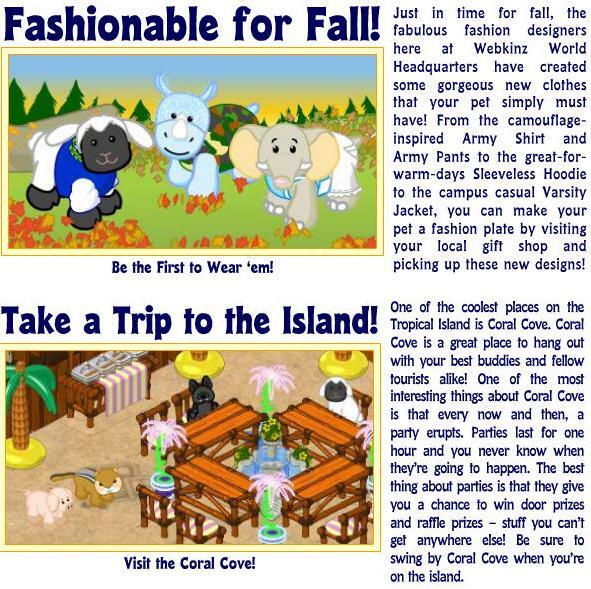 Here are the upcoming articles: Time for a Vacation – the Travel Agency has arrived to WEbkinz World. 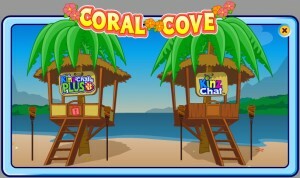 Go on a trip with your pet to a tropical Island, board on a pirate ship and hang out in the Coral Cove Room. 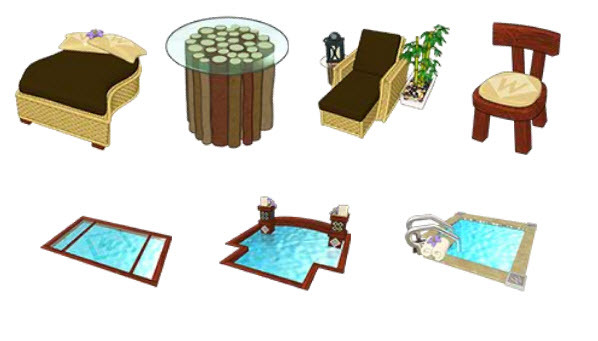 Check out the Spa. New Kinzstyle for Fall. 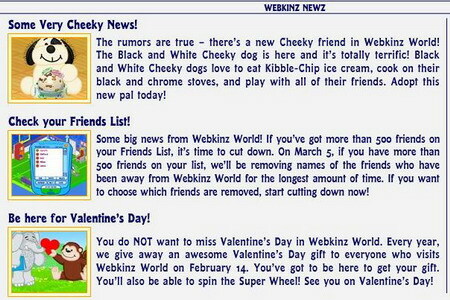 Besides what we posted earlier about the Smoothie Game and the new pets added to webkinz, there really isn’t much more news. 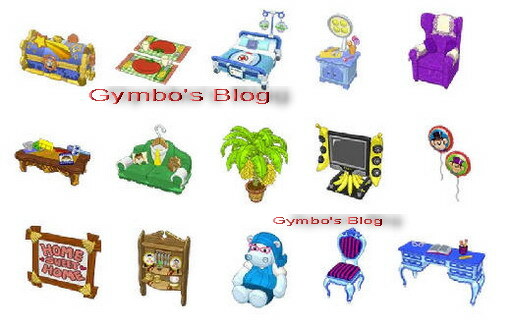 Here are the upcoming news articles you will be seeing. New Trading Cards Series three is here and it’s chock full of brand new surprises. 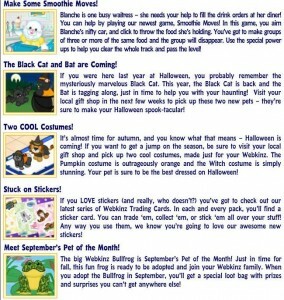 Cool trivia printed on back of most cards, stick webkinz world stickers all over your stuff (stickers come in every pack!) 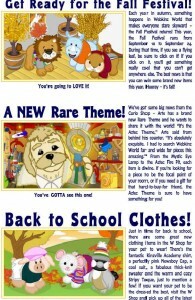 and join the search for the Magical Retriever. 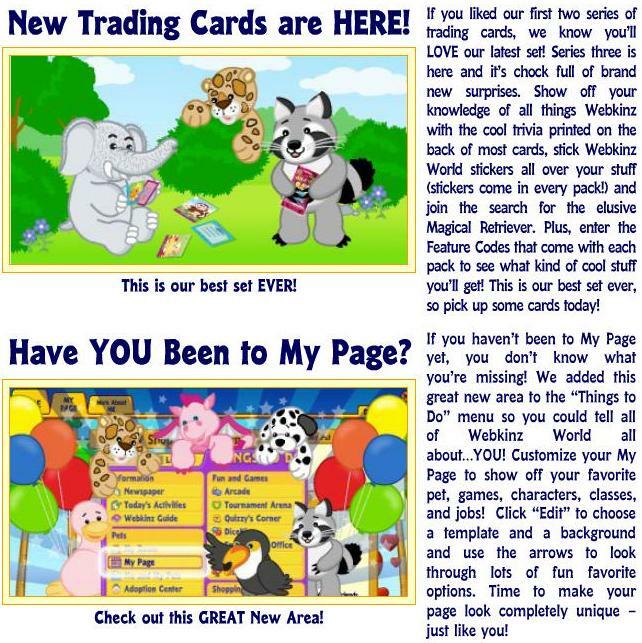 My Page is now available to more members. 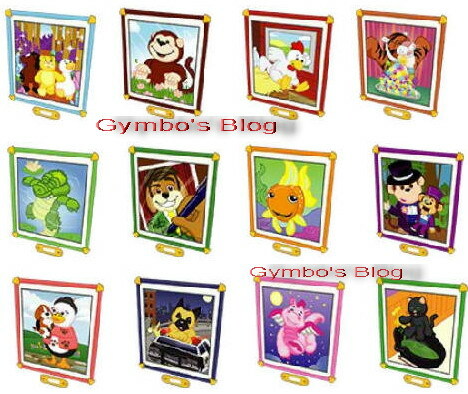 Customize your My Page to show off your favorite pet, games, characters, classes and jobs! 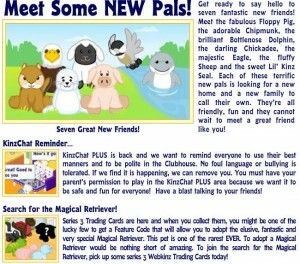 Get Ready to say Hello to seven fantastic new friends. 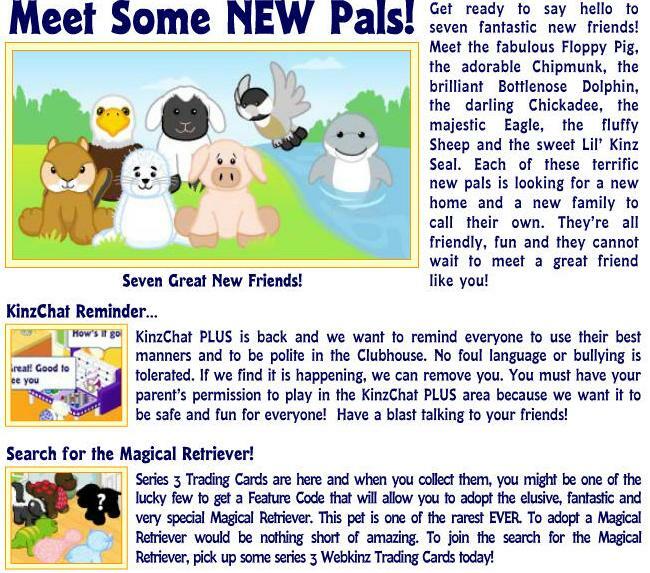 Kinzchat Plus is back, you must have your parent’s permission to play. Blanche is one busy waitress – she needs your help to fill the drink orders at her diner! 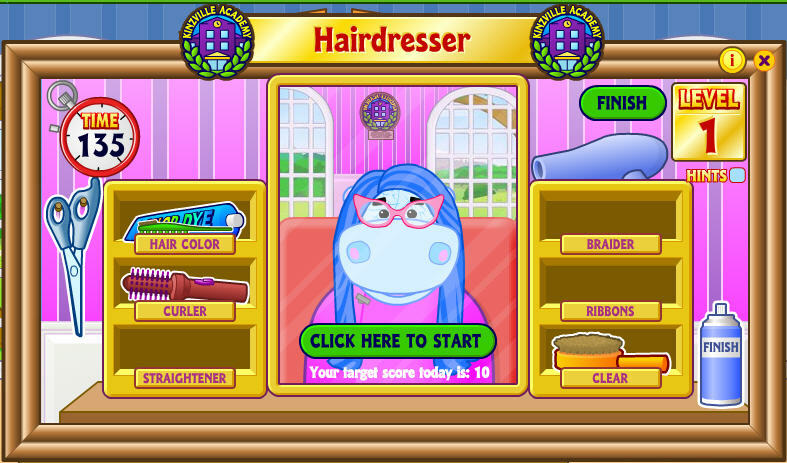 You can play by playing our newest game, Smoothie Moves! 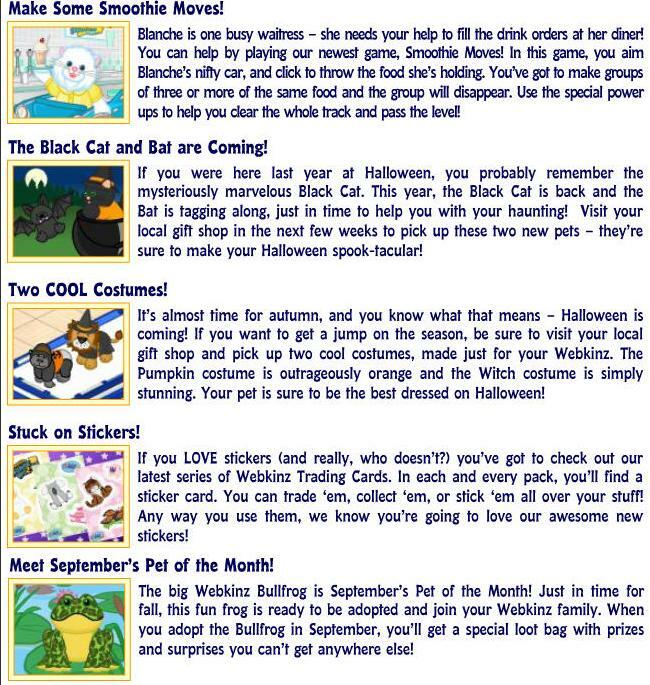 The Black cat and Bat are coming, they are sure to make your Halloween spook-tacular! 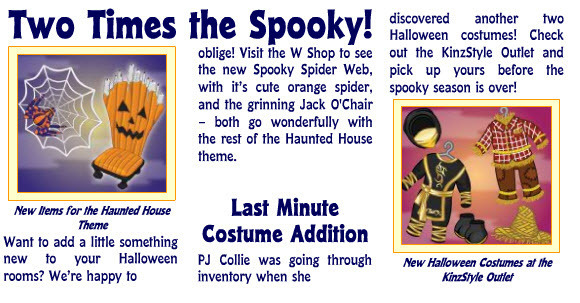 Two cool costumes, pumpkin and the Witch costumes will be found at stores. Bullfrog is September’s pet of the month! 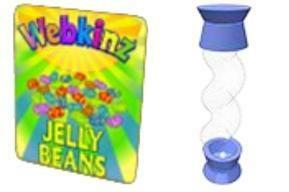 These items have also been added. Which aren’t exactly new, but it looks like we’re going to finally be able to purchase them in the E-Store maybe as early as this Saturday! It’s the zingoz Tree (outdoor only) and the Big Pile of Kinzcash Bed (indoor and underwater only). 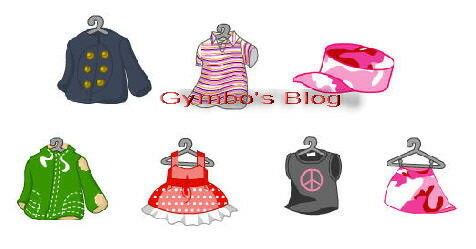 New kinzstyle clothes are going to be sold at your local retailers! The Sleeveless hoody and it’s companion piece the sleeveless Hoody set patns, Varzsity Jacket. 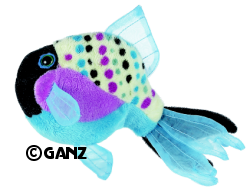 Have you noticed on the Vitual October Pets it says that there will be a Lil’ Kinz Blue Triggerfish. Does that mean that there would be a Red/Green/Yellow/Orange/Violet/Brown/Silver/Gold One soon? Take A Look: Oh no not again it’s not working! Sorry I will do it tomorow! 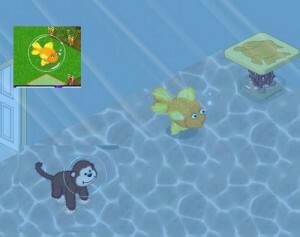 Now on all accounts: Two new Friends are making a Splash! 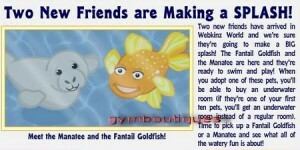 Two new friends have arrived in Webkinz World and we’re sure they’re going to make a Big Splash! 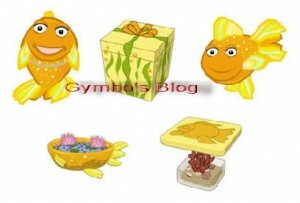 The Fantail Goldfish and the Manatee are her and they’re ready to swim and play! 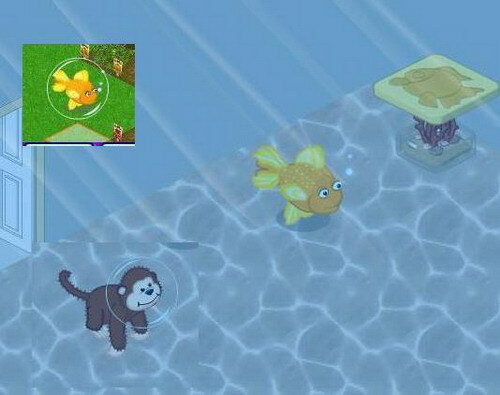 When you adopt one of these pets, you’ll be able to buy an underwater room (if they’re one of your first ten pets, you’ll get an underwater room instead of a regular room) Time to pick up a Fantail goldfish or a Manatee and see what all of the watery fun is about! There’s also a NEW MOD Tshirt in the W-Shop. 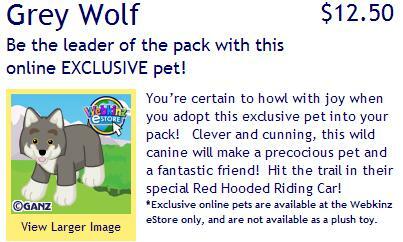 From the Estore, the Grey Wolf is available again this time it’s priced at $12.50 not $9 when it first appeared. 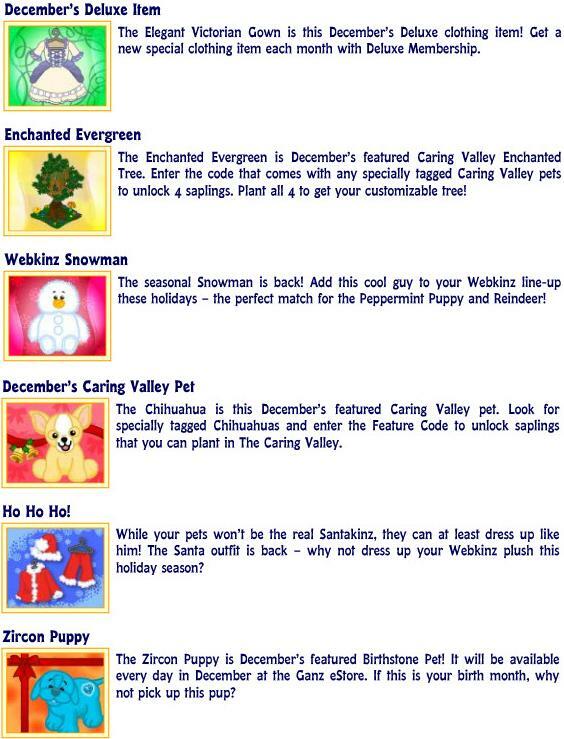 *The new pets have also been added to the Webkinz Catalog! * Sad to see the Beagle (my first pet on my own account), American Albino (just came out), and the Collie (a rare to find already) to be RETIRING! 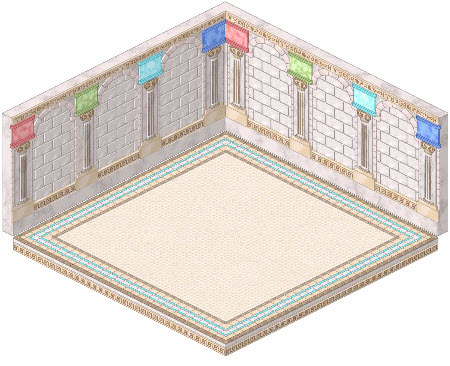 Well, everyone, we had two minor updates, so far, this week! I wasn’t going to post anything because what I have is so incomplete and speculative! But, I decided to let you have fun with trying to guess what’s coming up and to wonder, like me, on what some of these things might be! It’s interesting to say the least! Here’s what I have so far…. 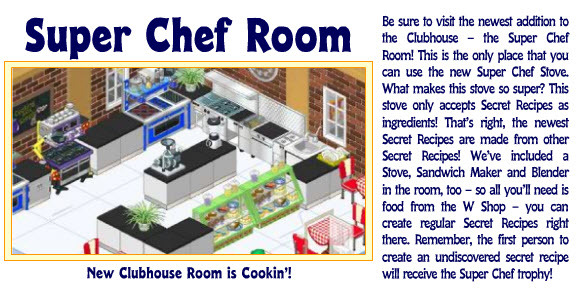 Notice that they mention the “Summer Sensation” coming up on June 28th and that there are changes to the clubhouse! 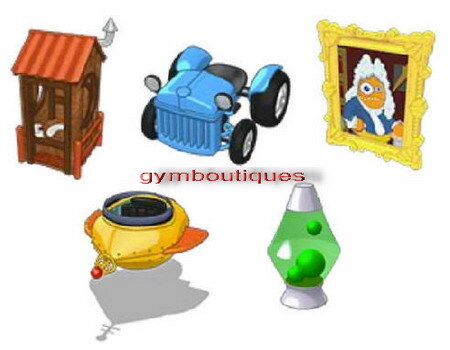 None of the items above had image files available, so I don’t have a clue as to what they look like. Most didn’t have descriptions either! 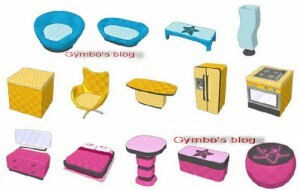 The first is the “Beauty Class Vanity” and the second is the “Cooking Class Griddle“! Obviously, they have something to do with the Academy Classes, but what, I don’t know! 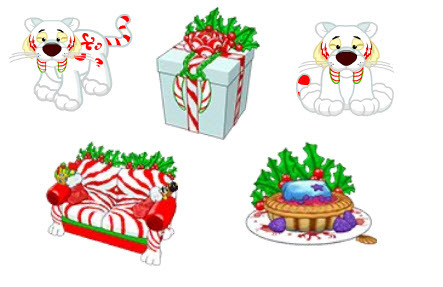 If you study the items I listed above, you can figure that we will see two of the pets that have gift boxes listed! That would be the Skunk and the Cocoa Dinosaur! 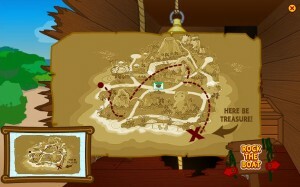 Notice, also, that there are two “Undersea” items listed, which brings up the idea of them doing an “undersea” theme! The rest of the stuff is just speculation as to what it may be! Some of the names are quite strange! One thing I will point out is that none of them were in the “food” catagory (other than the pet foods I separated out)! 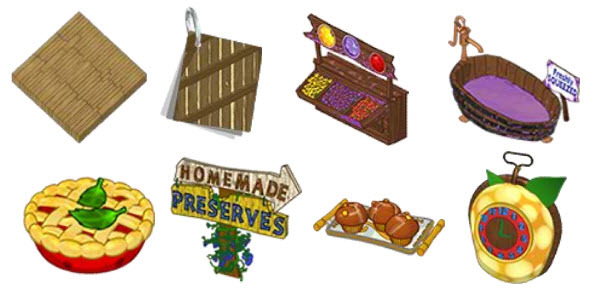 And if that wasn’t interesting enough, I discovered a couple of files listed where they have the games, academy classes and the clubhouse files! These will make you really wonder! 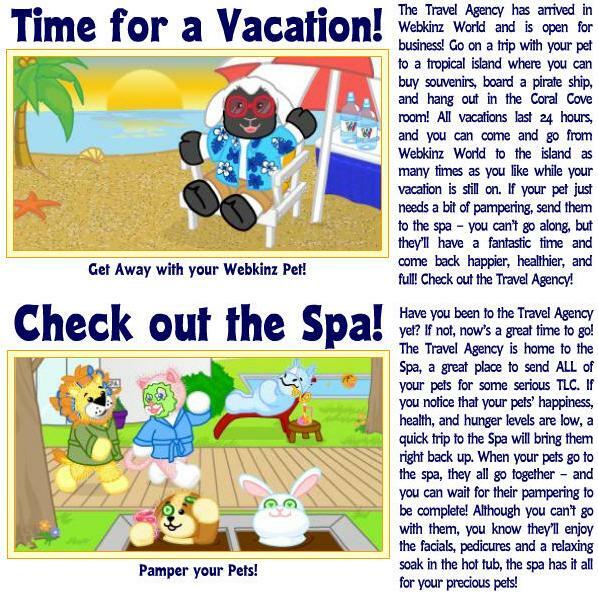 Is Ganz going to have a Vacation destination for our pets? 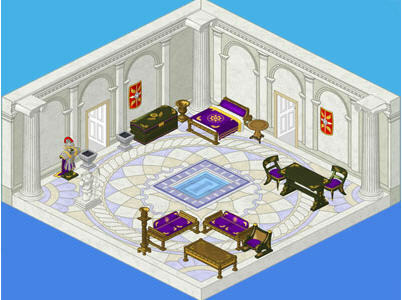 Is this the update to the chat room that they are talking about? Your guess is as good as mine on all of this! It will be interesting to see what comes into play down the road! Until then, we can only wonder! At least it will give you something to think about for a while! This is from this morning’s updates. 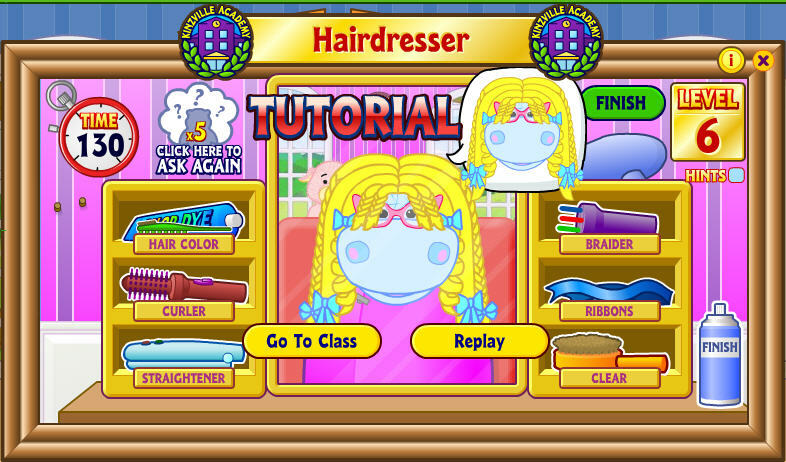 The Beauty Contest in the Kinzville Academy has you creating hair styles for Miss Plumpy! There are trophies that can be won here! 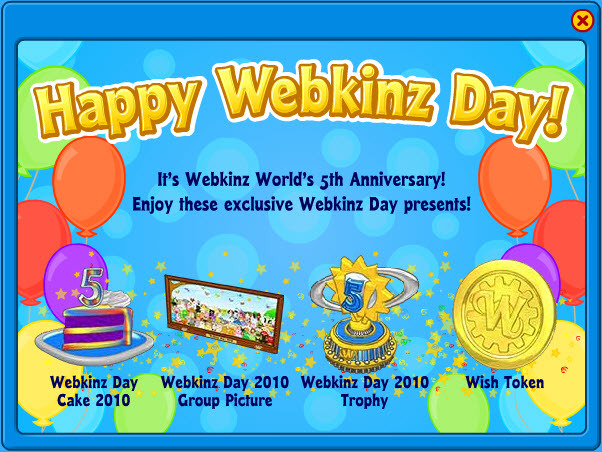 Unfortunately, they images of those trophies aren’t available as of yet! The New Pet Competition Stadium is also now available! The first contests will take place tomorrow, I believe! The only contest available at the moment is the “Beauty” contest! They will also offer Cooking, Inventing, Running, High Jump, and Swimming competitions! Here are the three medals that you can win in the Open Competition! There will be trophies to win here also! Those images are also not available yet! 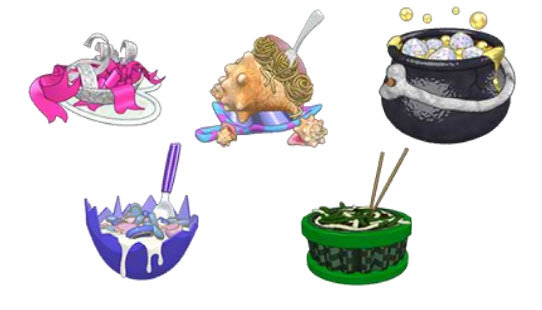 And finally, the next Wheel of Wishes Spin will take place on April 12th! 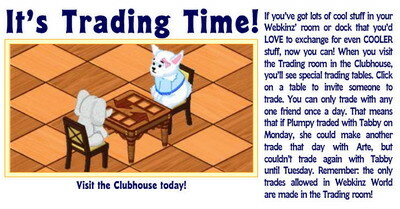 On the 13th, there will be a Bonus Spin on the Wheel of Wishes for Pink Poodle owners! 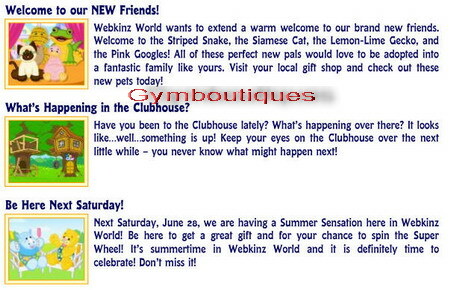 First of all, the Tiger Snake is now added to Webkinz World! The Pet Item is the Serpentine Stream and it’s animated! The Pet Food is called Eel Enchilada! 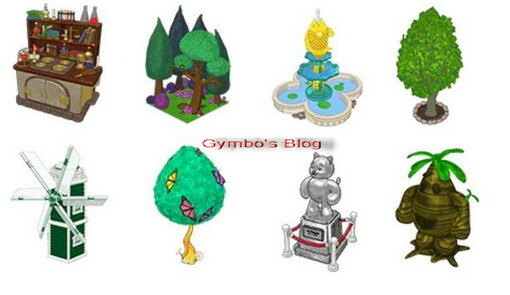 As most of you have noticed, there is a new theme in the Curio Shop. 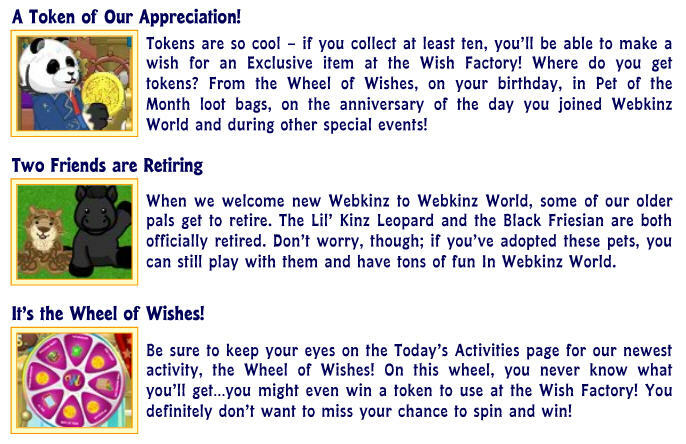 Also info on the Wish Factory. 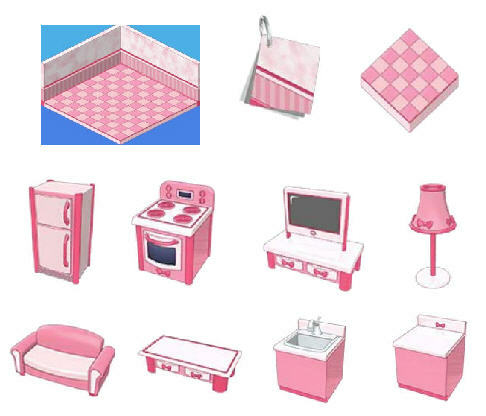 There will be more Pink items to come available later on! 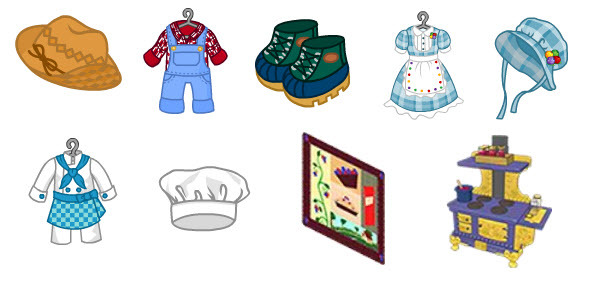 You can see images of the other items by looking at the them preview in the W-Shop! 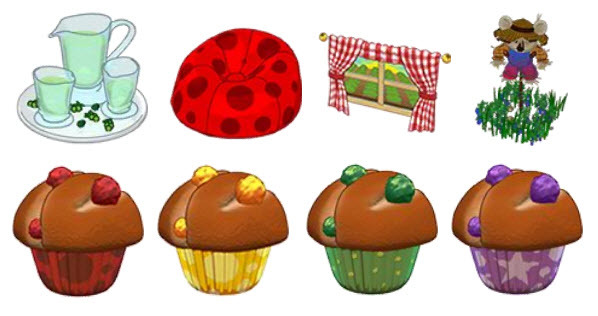 pictures of 3 new food items! 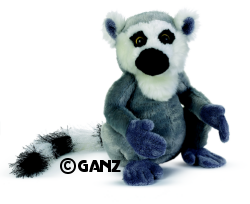 These are being given away as a celebration of the new Wacky Zingoz in plush form. 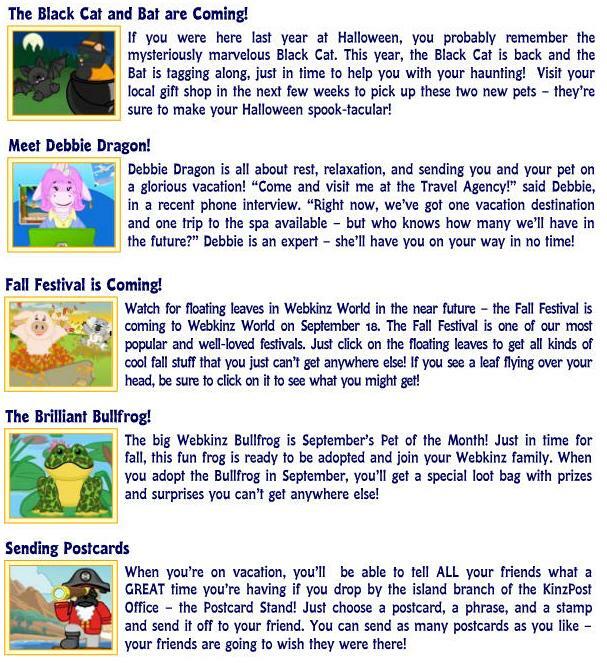 Watch for the flying Wacky and when you click on him, you get one of these bats! 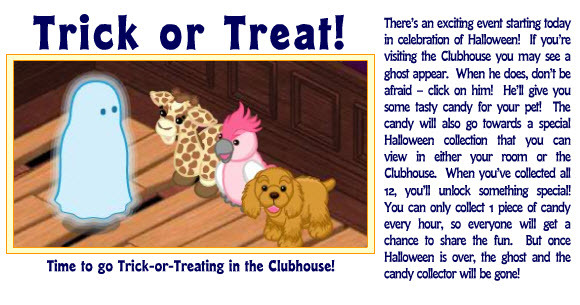 You have the Candy Gravity Bat, the Candy Hyper Bat, and the Chocolate Bat! 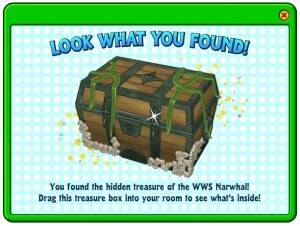 There is also a new trophy to get! It’s called the “Token Collector Trophy”! 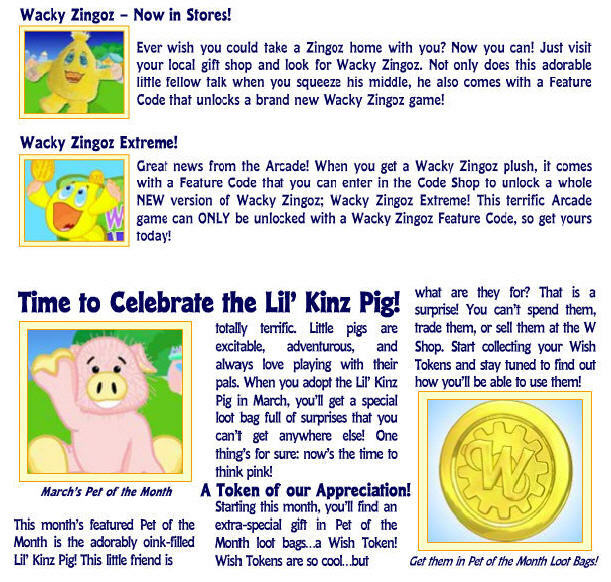 Wacky Zingoz, POTM and More…. Visit us on Valentine’s Day! 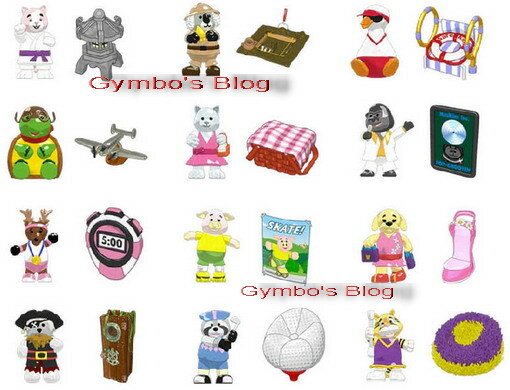 That’s what Ganz is advertising……… but don’t just visit them, visit my blog too! 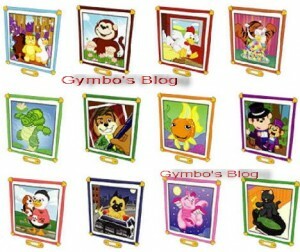 Lots of specials that day and of course the Winner of the Love Frog Giveaway will be announced then. Thanks to Merthyn for the info.